Unfortunately, cardiovascular disease, or heart disease, is very common in the United States. In fact, the Center for Disease Control (CDC) says that it is the number one cause of death for men and women in America. It could be due to poor diets and lack of exercise, but it can also be caused by genetics. If you have a close relative who has had a heart attack, stroke, diabetes, high blood pressure, or high cholesterol, your risk goes up as well. Now studies are also showing that your blood type could help uncover your risk of heart disease and other similar diseases. Which Blood Types Are More At Risk? Unfortunately, if you have the blood type A, B, or AB, research is finding that you are more at risk for a cardiovascular event or disease. The University Medical Centre Groningen in the Netherlands conducted research on over a million people to see if blood type and cardiovascular events are related in any way. The research consistently showed that people with any blood type but O had about a 9 percent greater risk. Further studies need to be done to figure out exactly why O blood types have less of a risk of a heart attack and other cardiovascular events. Researchers think perhaps people with non-O blood types may have higher concentrations of von Willebrand factor. 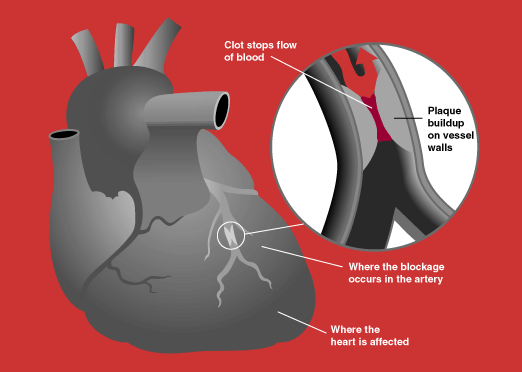 This is a blood-clotting protein that often leads to a heart attack or a stroke. People with blood type A often have high cholesterol as well, which can lead to a heart attack. Does this mean if you have an O blood type that you are completely safe from heart troubles? Of course not, but it may mean that you have a lower risk. Make sure to have a healthy diet and exercise frequently to lower your risk of cardiovascular events and disease. Also get regular check-ups with your doctor, especially if these diseases run in your immediate family. What do you think about these studies? What blood type are you? There are also studies that show you should eat differently according to your blood type. Do you believe any of this or do you think it is ridiculous? If you found this article interesting, please SHARE with your friends and family who might be interested in learning about blood types and their possible connections to cardiovascular disease and events! Subtle Signs of a Heart Attack in Women: Click “Next” below!